Summary: Agilent's new current probe handles a huge range and bandwidth. Consumers want their devices to run forever from a single photon harvested from a 20 nm square photocell, so we engineers are struggling to slash power consumption of our embedded products. To that end it's critical that we use tools to profile systems' power usage. It's tempting to just solder a small sense resistor into the power supply and run that to a scope, but that approach simply won't work in many situations. uA- or nA- level draws will need at least some amplification before anything will show up, but just tossing an op amp in may give disappointing results. Bandwidth can be a problem, and low-level measurements are plagued by noise issues. Further, the dynamic range of, say, a cell phone going from idle to transmit is so huge that a resistor giving good results at full-power will be much too small to show anything interesting when idling. Agilent has a new and somewhat different offering. It's a fancy probe - really a probing system - for their Infinivision and Infinium oscilloscopes. There are two members of this product family: the N2820A, which has two channels, and the N2821A, a single-channel smaller brother. With the N2820A one observes a single current node, but each channel can be set to a different gain. With a single sense resistor (more on this shortly) the user can thus watch a huge dynamic range of currents. One channel might show a cell phone's 2 A transmit current, while the other zooms in to see the phone sleeping at a handful of mA (or less). The main specs are these: minimum current 50 uA, max 5 A. The bandwidth is much wider than any of the other current-measuring devices I've profiled: the zoom-out channel manages 3 MHz, while the zoom-in handles 500 KHz. The probe operates as one would expect: it monitors voltage drop across a sense resistor in series with the target board's power supply. Internal magic amplifies the signal over a wide bandwidth. But the sense resistor is built into a number of plug-in modules. 20 mO and 100 mO modules are included, plus one that lets you insert your own resistor. These are little SMT parts so one must be careful to not exceed the rated power. Agilent provides an Excel spreadsheet that simplifies the (simple) calculations. A number of different leads are provided to connect to the target board. One is a very interesting make-before-break connector; with this in place you can connect the probe to a powered system without interrupting the system's operation. Agilent scopes are highly integrated with the current probe - astonishingly so. The scope automatically changes the normal V/cm vertical display to mA/cm. You never see the drop across the sense resistor in volts as the scope does all of the work. And when the scope detects the probe it adds a number of additional metrics to the measurements window. In the following picture it displays peak to peak in mA, and total "charge" (Amp-hours) for the waveform displayed on the screen. I had the probe hooked up backwards (to see what would happen) and it correctly displayed this in -nAh. The probe connected to a scope and an eval board; note the two channels used for zoom in and zoom out mode. Agilent tells me (though it's not in the manual) that it can be used as a voltage probe as well, and has a sensitivity of 45 uV, with an astonishing 1.5G Ohm impedance. On Infinium scopes a "dual grid" view is available which apparently allows simultaneous viewing of the waveform using two different time axis. My scope doesn't support that so I couldn't test the feature. The manual is adequate, though it says little about actually using the device. I wish it didn't assume one has read the entire thing; for instance, it's very clear how to change an ID resistor, but what the heck is an "ID resistor?" That is explained in a previous chapter. Few of us read manuals cover to cover. The probe only works with Agilent's 9000 H- and A-series, and 2000, 3000, and 4000 X-series scopes. These instruments have nine-pin connectors for each probe input that supplies information about the probe type and value of the sense resistor, as well as the software needed to make current and charge measurements. At $4000 this is not a cheap probe. 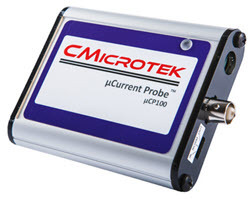 But most decent current probes cost several thousand dollars (for example: http://www.tek.com/current-probe), so it's not unreasonable. The single-channel N2821A is $3000, but I'd spring for the extra grand to be able to really exploit the dynamic range. The key takeaway about this product is it measures a huge dynamic range of current (20,000 to 1) over a very wide bandwidth (up to 3 MHz). Using the N2820A one can watch both very low idle currents and big honking active mode current on two different scope channels, without changing the sense resistor and without causing so much voltage drop the system crashes. If you don't need a wide dynamic range, get a different product; if you do, this is a very impressive piece of equipment. So far I have not found any other device that can measure low-level current over anywhere near a 3 MHz bandwidth.